Blood stains the sidewalk in front of the Sunoco gas station at 23rd Street and Fairmount Avenue, where two loose dogs pit bulls attacked another dog on Friday, December 16, 2016. Animal control officials are seeking to locate a pair of aggressive dogs that attacked another dog being walked by its owner in the Fairmount section of Philadelphia on Friday morning. The injured pet, an eight-year-old lab mix named Ilsa, was euthanized after suffering life-threatening neck and head wounds, according to Penn Vet's Ryan Hospital. A 43-year-old woman was walking her dog around 5:54 a.m. when the two pit bulls attacked, police said. The dog suffered critical injuries and was taken to the Penn Vet facility for treatment. The animals reportedly are still on the loose. 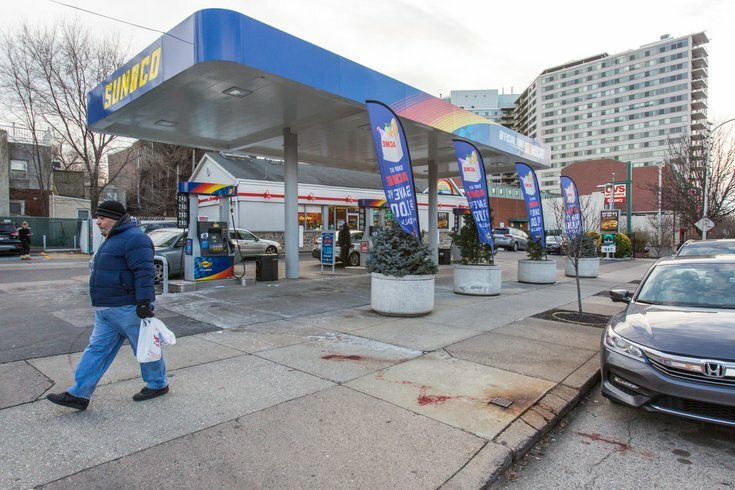 The attack left blood stains on the sidewalk in front of the Sunoco gas station at 23rd Street and Fairmount Avenue. Animal Care and Control Team of Philadelphia has received several reports of two dogs roaming together near that intersection, according to a posting by the agency on Nextdoor at 2:35 p.m. Friday. ACCT officers will continue patrolling the area. ACCT officials are seeking a description of the aggressive dogs, according to the posting. ACCT officials did not immediately return a request for more information. "We do not currently have a description of these dogs and are seeking any information that would assist our Animal Control Officers in their capture and impoundment," ACCT posted on Nextdoor. "If you have any information you are encouraged to contact our dispatch office at 267-385-3800, option 1." Nextdoor is a private social network that enables members of the same neighborhood to share information. Agencies also can post pertinent alerts within the network.